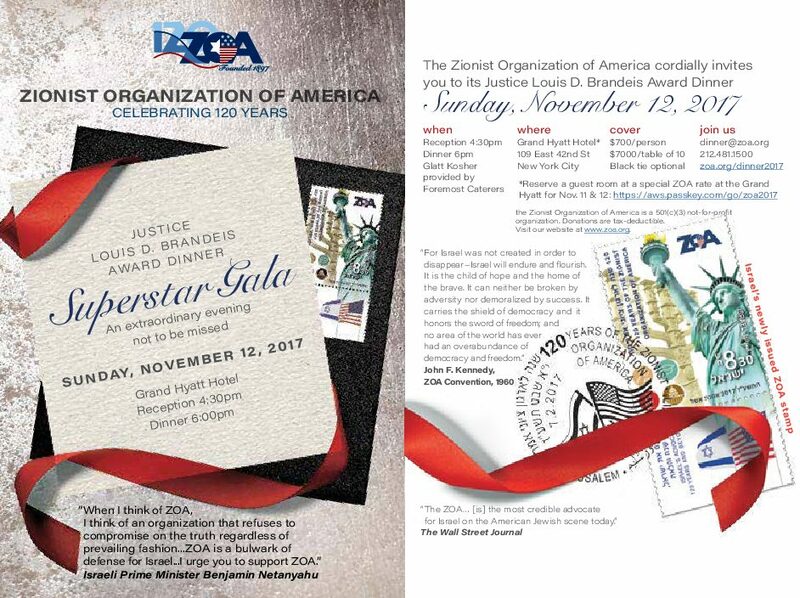 Don't miss the ZOA event of the year! Join us for the annual Louis D. Brandeis Award Dinner/Superstar Gala. Read the invitation and use the 'Register' link to make your reservation. Don't hesitate to call the ZOA New York office if you have questions. 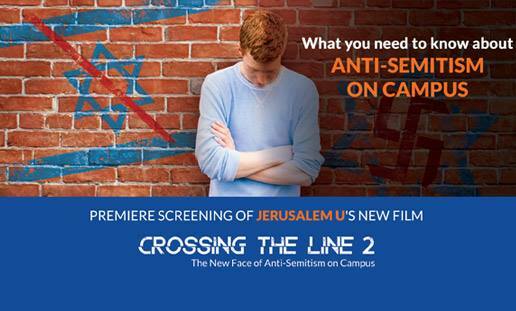 ZOA-NJ presents Crossing the Line 2, a look into the troubling trend of antisemitism on the college scene. Jewish students are under attack as never before. Crossing the Line 2 is a gripping, up-to-the-minute documentary illustrating the challenges YOUR kids will face. This eye-opening film exposes the NEW antisemitism. It will be followed by a panel discussion with campus and legal advocates to learn what you can do about it. The panel discussion features Justin Hayet, Student Activist (featured in film), Zach Stern, ZOA National Director of Campus Programs, and Susan B. Tuchman, Esq., Director, ZOA Center for Law and Justice. To learn more go to Step Up For Israel: Crossing the Line 2. ____ 7:30 VIP Reception with Panelists Donation $36/$50/$100 to sponsor, includes ticket 8:00 Film Screening followed by Panel Discussion FREE for students! Bring your teens! Tickets $15.00 Early-bird tickets $12.50 until 5/16 ____ Sponsored by ZOA-NJ. Co-sponsored by: Congregation Beth Shalom of Teaneck, StandWithUs, Camera on Campus, Masa Israel, Hillel Binghamton. The rally will be held on July 22 from 5:30-7:30 pm in Times Square. Organizers are preparing for over 20,000 people. • Over 35 sponsors include ZOA, Wiesenthal Center, JNF, many political and religious groups. 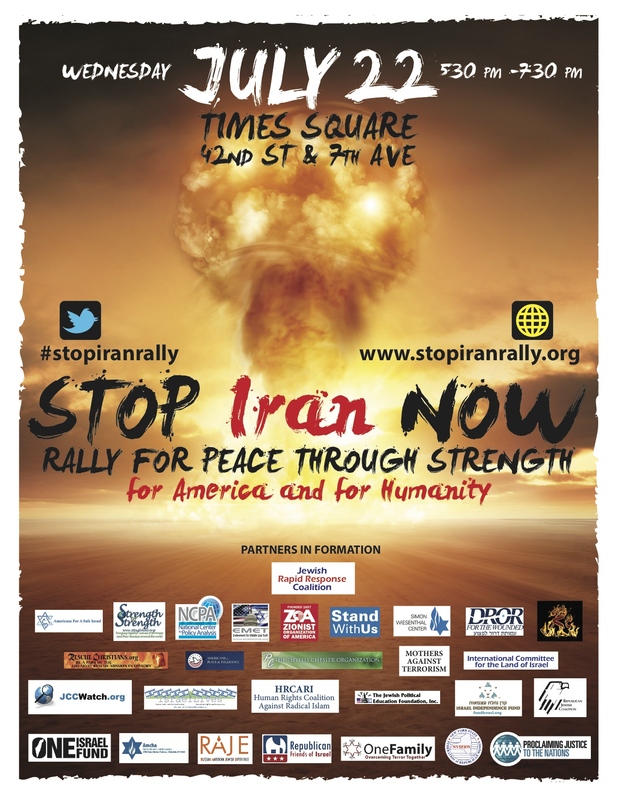 • Time to unite and show our determination to stop Iran from gaining nuclear weapons! 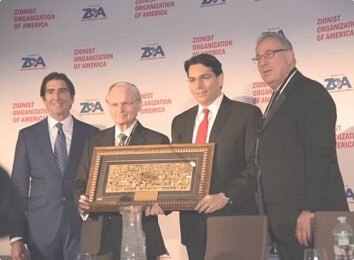 Hear ZOA National President Mort Klein deliver his trenchant and passionate analysis of the lies told against Israel and their impact on Israel's safety and security, and learn what actions YOU can take to make a difference for Israel's future. Join us for an intimate dinner reception at the shul at 6:15 pm, prior to the 7:30 pm speech. Sponsorships available $50, $100, $180, $360. 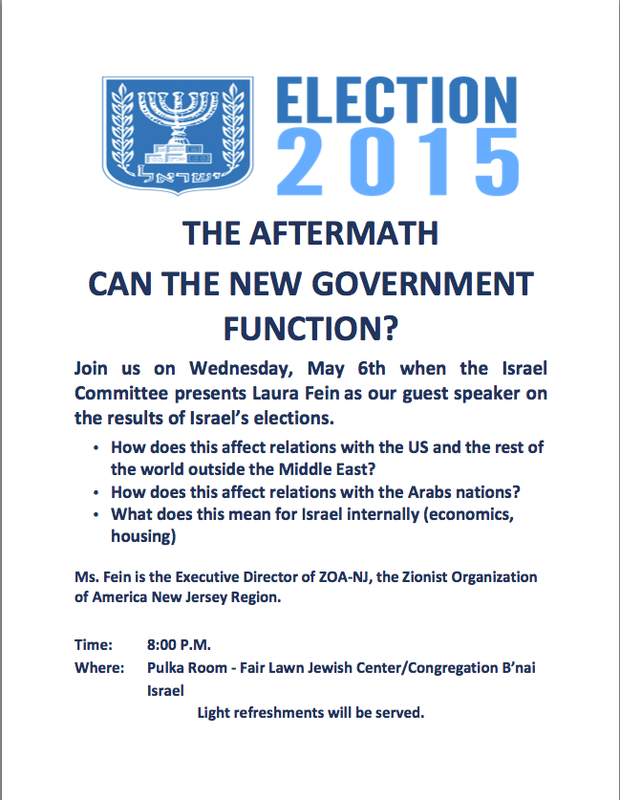 Contact Laura Fein, Executive Director of ZOA-NJ at ZOANJ@ZOA.org for more information. Experience the provocative and controversial film that examines the rise of J-Street, the well-funded activist organization with a powerful marketing effort and a seemingly idealistic message. 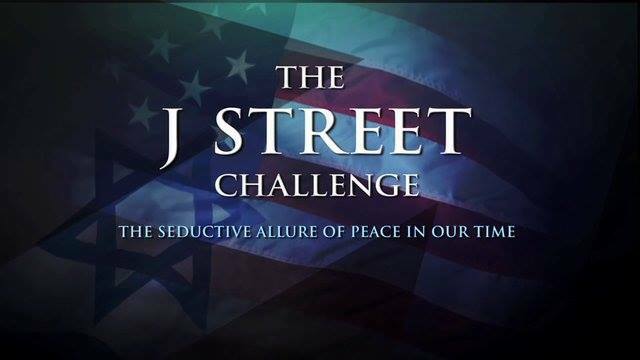 After the screening, the film's producer Dr. Charles Jacobs will lead a discussion of the film's creation and its impact, especially in light of the recent Gaza war and the 2-1 vote by members of the Conference of Presidents of Major Jewish Organizations not to admit J-Street as a member. What does it mean to be pro-Israel? See the film and decide for yourself! Tickets $12.50. Producer reception before the film at 7:30, $25, includes ticket. A Film Experience to Remember! This powerful 64-minute documentary not only presents the undeniable historical connection between the Jewish People and the Land of Israel, but also succeeds in debunking the propaganda, myths and misinformation that have become accepted as truth by so many. Come take an inspiring tour of Jewish history, featuring the insights of Rabbi Jonathan Sacks, Professor Alan Dershowitz, Pulitzer Prize winner Bret Stephens, Professor Ruth Wisse, Canadian MP Irwin Cotler, PMW Director Itamar Marcus, Author Yossi Klein HaLevi, and more. Producer-Director Gloria Z. Greenfield, an award-winning filmmaker, will introduce and answer questions after the film. Sponsorships available: $36, $75, $125. All Sponsorship levels include private reception with Ms. Greenfield at 6:45 pm, prior to film screening. 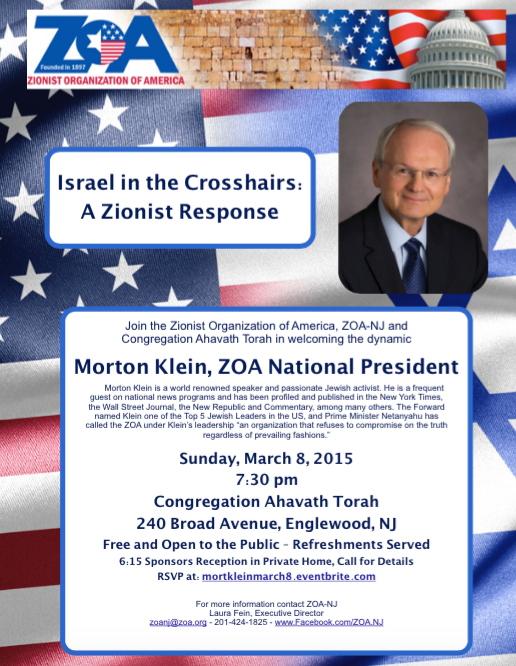 This screening by ZOA-NJ and Congregation B'nai Tikvah is cosponsored by American Friends of Yeshivot Bnei Akiva: 75 Years Training Israel's Future. 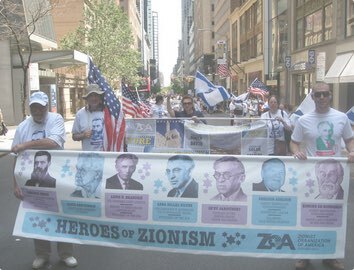 Islamist ideologues understand the power of rewriting history and they have broadened their campaign to dismantle the nation-state of the Jewish people with the erasure of Jewish history and creation of pseudo-history. 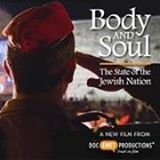 Body and Soul – The State of the Jewish Nation, a new documentary film by award-winning filmmaker Gloria Z. Greenfield, presents a comprehensive examination of the broad and deep connections between the Jewish People and the Land of Israel. World-renowned historians, archaeologists, political scientists, religious leaders, and international law and media experts trace the evocative evolution of the relationship between the Jewish People and their homeland that is more than 3,000 years old. HAPPENING TOMORROW! 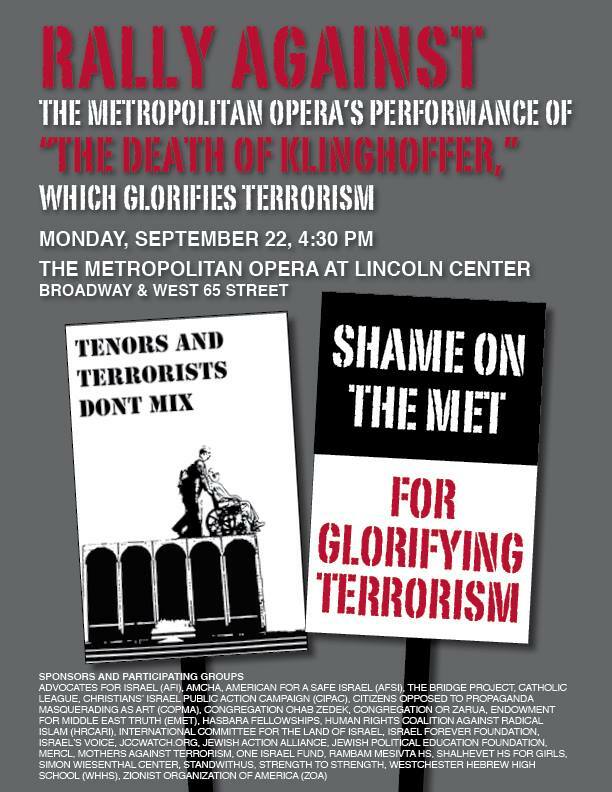 Monday evening is The Metropolitan Opera's Opening Night Gala for the hateful performance of The Death of Klinghoffer. 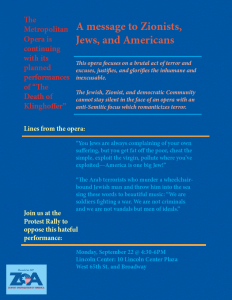 Leon Klinghoffer's own family has requested the cancellation of this performance. Please attend the protest rally of this horrific opera. SHARE with friends, family, and colleagues–– this cannot go unnoticed!